An item reported that at Vlissingen, Netherlands the frigate Zr. Ms. Prins Frederik der Nederlanden (1) and the corvette Zr. Ms. Sumatra (2) were fitted out to depart in October. The frigate was bound via Cape Horn for South- and North America an the corvette for the Mediterranean to visit Alexandria (Egypt), Smyrna, Constantinople (Turkey), Athens (Greece) and Trieste and Venice (Italy). The frigate Zr. Ms. Prins van Oranje (3) was bound after her arrival for a voyage towards the USA. 1. Former IJssel, frigate, 2nd class, on stocks at navy yard at Rotterdam, Netherlands on 18 December 1830, launched 29 June 1840, renamed Prins Frederik der Nederlanden in 1844, on stocks at the navy yard at Amsterdam, Netherlands for rebuilding as floating battery Salamander in 1859, launched in 1860, training battery in 1867, towed to the navy yard at Willemsoord, Netherlands to be broken up,call sign as Salamander GQTHJ, technical specifications as a frigate dimensions 46,21 x 11,91-12,20 x 5,17 (fore)-5,74 (aft) metres, a displacement of 1.461 (design) metric tons of 1.000 kg, 1.583 (in service) metric tons of 1.000 kg-1813 (full load) in metric tons of 1.000 kg, sail area 1.659 square metres, a crew numbering 320 men and an armament 44 guns and a floating battery displacement 1.125 (design) tons of 1.000 kg, a crew numbering 200 men and an armament of 22 guns (4-60pd guns, 18-20”grenade guns) and as dimensions 46,21 x 11,91-12,20 x 2,80 metres. 2. Sumatra also called Sumatraan, ‘kuil’corvette, on stocks at the navy yard at Rotterdam, Netherlands by C.J. 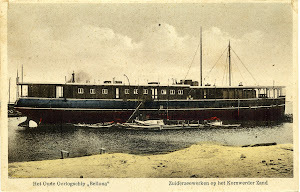 Glavimans on 26 October 1843, launched on 18 May 1848, transferred to the navy yard at Hellevoetsluis, Netherlands on 28 August, there docked and coppered 9-23 October, commissioned on 1 May 1849, burned off Kema, Celebes on 16 May 1854, wreck probably sold on an auction in May 1856, displacement 942 tons and as dimensions 39,5 (waterline) x 12,00 (inner hull) 12,30 x 5,00 (fore)-5,40 (aft) and a hold of 6,2 metres and an armament of 26 guns. Based on Sir William Symonds design. 3. Former Waal, frigate 1st class, call sign GQSB, on stocks at the navy yard at Rotterdam, Netherlands by P. Glavimans Jz. 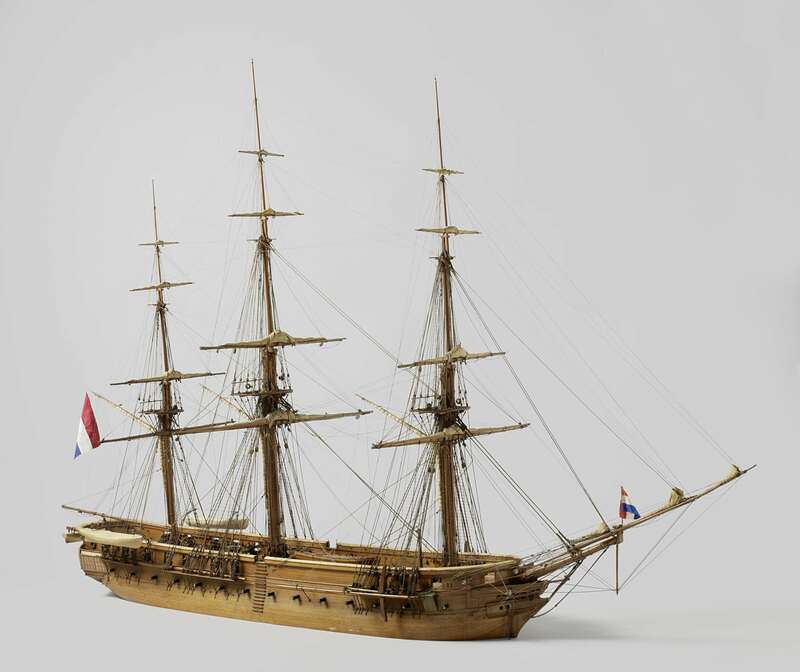 In August 1828, launched on 16 May 1840, renamed Prins van Oranje in 1844, later guard ship, sold on a public auction at the navy yard at Hellevoetsluis, Netherlands at 12.30 o’clock on Thursday 6 Augustus 1896, sold to Mr. M.S. Sprenger, Amsterdam, Netherlands for ƒ 12.263,63, dimensions 54 (load line) x 14 (inner hull) x 5,8-6,3 (aft) x 7,13 (hold below upper deck) metres, 2.481-2.485 tons displacement, 60 (peace:30-30pd guns, 30-30pd carronades, 2-12pd guns))-70 (war) guns and a sail area of 2.170m2.